finder.com.au Archives - jxeeno™ blog. Today, I have some very exciting news to share. First, that myNBN.info is now part of the finder.com.au family. And with that, I also step into the role of Publisher for Broadband and Internet TV at finder.com.au. 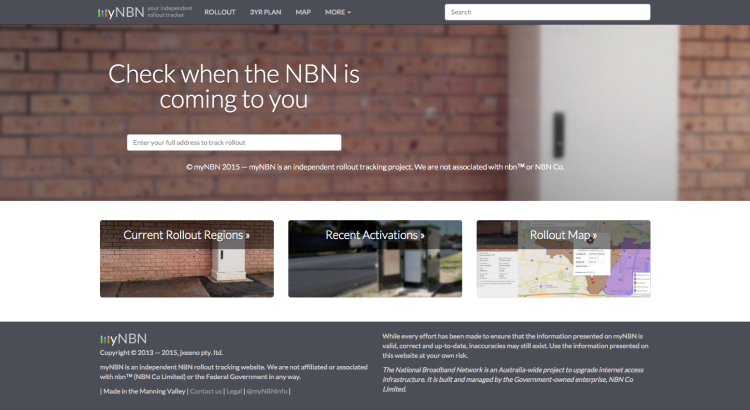 When I created myNBN almost three years ago now, my objective was to help Australians track the National Broadband Network rollout in their area by making a website that was accessible and easy to understand. Amazingly, over 800,000 Australians have done exactly that using the website. By moving the site to finder.com.au, I hope to streamline my own workload, and also allow the site improve, expand and grow by leveraging the skills and expertise of the team at finder.com.au. I will still continue to be intimately involved with the site as the Publisher for Broadband and Internet TV at finder.com.au. We’ve already planned user experience improvements, while also maintaining the detailed information that myNBN is known for. There are also plenty more exciting projects ahead in the roadmap to look forward to! I would like to say a huge thank you to everyone who has supported me on this adventure thus far, especially those who have donated in the website’s early days. It’s been a real pleasure working with everyone!